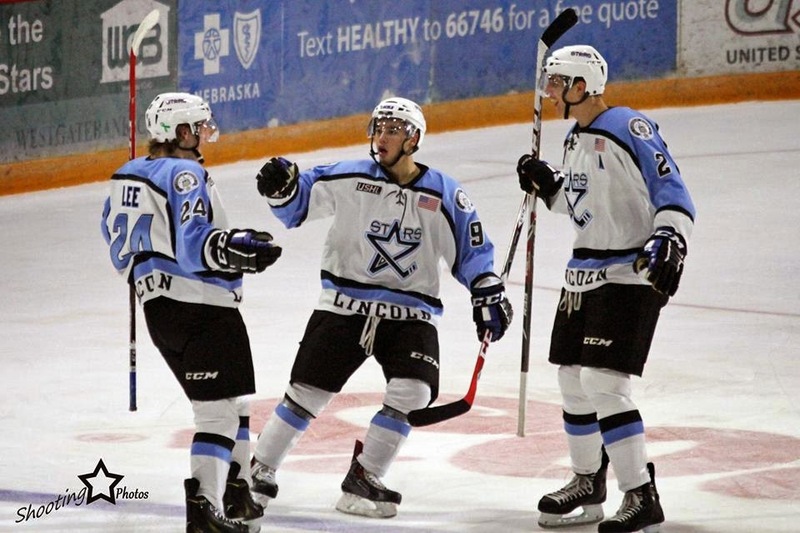 The Lincoln Stars came up a bit short Friday night at the IceBox as the visiting Muskegon Lumberjacks skated to a 3-2 victory in the first game of the two-game weekend series between these two teams. With the loss, the Stars dropped to 1-3-0 in four games this season. Muskegon improved to 4-2-0 with the win. Considering the lackluster performance in their last game (vs. Waterloo this past Sunday), I really expected the Stars to start the first period of this game with a lot of energy and aggressive play. Unfortunately, I didn't see that. The 'Jacks put two goals up on the scoreboard in the first 10 minutes of the first period and put the Stars behind the 8 ball early. The first Muskegon goal was of the powerplay variety, with forward Jack Rowe roofing a backhand up high past Stars goaltender Peyton Jones. The second goal came on bang-bang play right in front of Jones in which the Stars were unable to clear the puck, allowing 'Jacks forward Mason Jobst to pounce on a loose puck before scoring. Lincoln defenseman Cam Lee breathed life into the Stars later in the first period with a rocket past Muskegon goaltender Eric Schierhorn to pull the home team to within one goal. On that particular play, the Stars did a good job cycling the puck in the offensive zone before defenseman Connor Frantti found Lee wide open at the top of the circle. Muskegon took the 2-1 lead into the first intermission, and also held a 10-7 advantage in shots on goal. Neither team would score in the middle stanza, but I thought this was Lincoln's best played period of the game. Shots were 13-8 in favor of the 'Jacks in the second, but I thought Lincoln had the better scoring opportunities and controlled play for the most part. In the third, Muskegon scored the eventual game-winning goal just two minutes into the period with a nice play by forward Matheson Iacopelli. After his initial shot on goal was blocked by defenseman Ryan Jones, Iocopelli found some open ice in between the top of the circles and awaited a nice pass from David Keefer. Iacopelli didn't waste time with his second shot opportunity as he wristed it between the legs of Jones. Give the Stars some credit here, down two goals in the third period. They didn't give up. Lincoln forward Max Humitz brought his team to within on goal later in the period with a screened slapshot after a nice feed from forward Ludvig Hoff. Humitz cycled the puck from along the boards before feeding the puck to Connor Frantti at the point. Frantti's point shot was blocked in front, and the rebound went right to Hoff. Humitz had worked off the board and found a quiet spot on the ice just 10 feet in from the blueline and ripped the puck past Schierhorn. Try as they might, the Stars were not able to score the equalizing goal in the remaining 7+ minutes of the third period after Humitz's goal. 'Jacks take this one by a score of 3-2. Shots on goal were 31-22 in favor of the Lumberjacks. The Stars were 0-for-3 on the powerplay, while the 'Jacks went 1-for-4. Lincoln's PK unit continues to struggle so far this season. The Stars are dead last in the USHL in penalty kill percentage (64%), a good ten percentage points behind the next team (Green Bay at 75%). Peyton Jones stopped 28 of 31 in the loss, while Eric Schierhorn stopped 20 of 22 to get the win. Overall, I thought Jones played very well despite coming up short. It was hard to fault him for the first two goals, but I know he wants that third Muskegon goal back that beat him five-hole. Jones also didn't get a lot of help from his teammates on the offensive side of the rink. You aren't going to win too may games when you manage 22 shots on goal. The Stars will look to even out the weekend series against Muskegon with a win tonight at the IceBox. Puck drops at 7:05pm CST. Quick note: Yesterday afternoon, Stars forward Jared Bethune ('97) announced via Twitter that he had singed with the WHL's Prince George Cougars. The news definitely caught me off guard. I had heard some rumblings earlier this week about Bethune leaving the Stars, but his decision to sign with a major junior team really surprised me. Hopefully this is not a decision he regrets later on in life. Since he has signed with a major junior team, he will not be allowed to play college hockey (Bethune had previously committed to UMD). As one door closes, another door opens for a player on this team (who wants to be here) to rise up and take advantage of the opportunity of more playing time. Agreed. I thought Grant looked very good this past weekend, especially Saturday night when he was paired with Christensen and Polino. Lincoln very fortunate, Jozefek the perfect upgrade to Bethune. Superior vision, speed and play-making abilities has yet to translate into any time on power play? A former 1st Round, 7th overall pick in 2013 USHL Phase 1 Draft and two-time NJ High School state scoring champion as a freshman and sophomore struggles to dress regularly on a team averaging less than 3 goals per game? Only 5 games into a very long season and Jozefek is the youngest player on the team...his time is coming (and is probably already here). Only 7 USHL teams average more than 3 goals a game (less than half the league)...it's not like Lincoln has been dreadful. Looking forward to seeing what Grant can contribute and at the very least, it's nice to have a 97 who WANTS to be in Lincoln and work hard rather than look for everything to be handed to him before bolting. Would like to see #25 on ice more often, has earned it a bit more than others. Definitely has added much needed skill and energy upfront. Sounds like the taboo of being youngest player on the team ended him up on the affiliate list because he can certainly play at this level? Hopefully we can build on a solid weekend of games against a strong opponent! I see the Jozefek fan club found this blog. He had a decent weekend (1 assist in two games) but lets not anoint him as the next Kevin Roy just yet. He's a '97 who has to earn a spot on the roster, just like every other player. Just about every player on this roster was all-word on his midget or HS team. They all have to earn playing time. Bethune is a future 2nd or 3rd round NHL pick, so you don't replace him. Losing him hurt. That's enough. People are getting too snarky in this thread. If you have nothing nice to say, don't say it.